We want to chase 75 degrees all over North America in and, sometimes, out of campgrounds. It is especially nice to camp without needing utility hookups. Several places (e.g., Kentucky Horse Park, several Ohio state parks) allow discounted parking on grass without hookups. Perfect if you don’t need electricity or water — and solar panels are so much quieter than a generator. We assumed, with two 125 watt solar panels, we could keep them flat on the RV’s roof and we’d have plenty of solar recharging for the RV’s two batteries. This seemed mostly true throughout the past four years. If the solar panels had clear view of the skies, if the weather was fair with lots of sunshine, the two panels did fine. There are, however, winter days with limited (and low-angle) sunshine when we capture solar energy for far fewer hours. Too, we have been only recharging a 225 amp hour battery bank, a pair of 6v 225 amp hour batteries wired in series. We want to increase our battery capacity by two-fold and we want to increase our solar panels output to the solar charge controller. Tilting the solar panels seemed the simple solution. Our criteria were, (1) easy to install; (2) easy to operate from a ladder at the RV’s side. We found very nice ready-made tilting hardware from Go Power! through Amazon. We purchased two sets for our two 125-watt solar panels atop our RV. These Go Power ARM-UNI Tilt mount kits look fine and meet both criteria perfectly. The aluminum parts are smoothly finished and accurately drilled. All mounting bolts, nuts, washers are stainless steel. 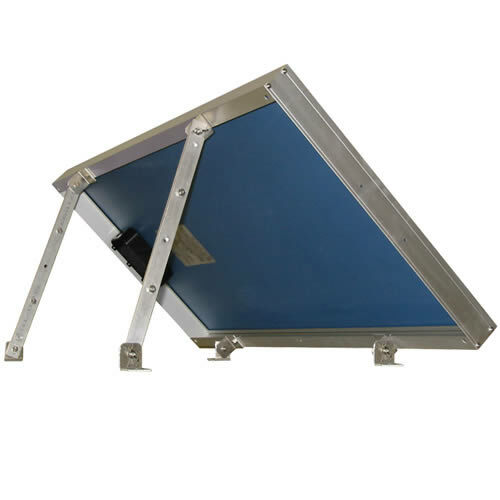 We mounted the supplied brackets atop our existing Z-brackets on our roof to provide an additional 1.5 inches clearance above our roof surface. All to gain and no disadvantage for us. The kits also include a set of well-nuts for mounting through the roof surface — we neither wanted nor used the well-nuts. 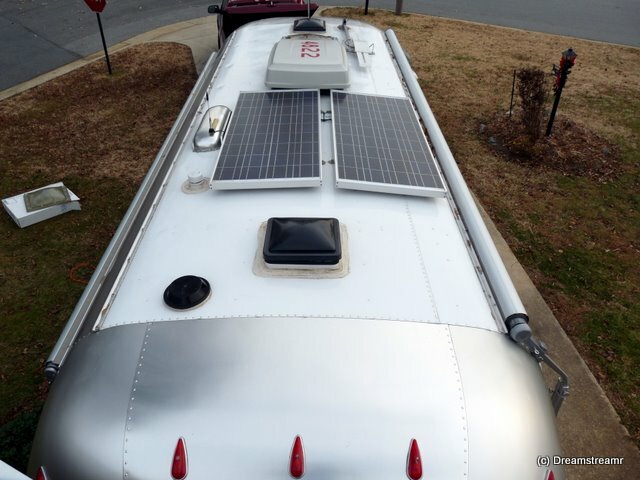 Oddly, our solar panel package (purchased and installed 2007) also included well-nuts for installing the panel feet (z-brackets) to the RV roof. These well-nuts might be just the trick for some roofs but we just wouldn’t again use them on an aluminum roof like our Airstream travel trailer. The problem with expanding anchors like the well-nuts in a sheet metal roof: they require a large hole and they just aren’t necessary. Our solar panel installation was to have been a simple affair in November 2007. Jim briefly chronicled it in our journal (see week of Nov 7) at the time and it looks easy if you read it. We might not have mentioned before, Jim spent less than a day installing the solar panels and charge controller and an entire week tracing the resulting short circuit and repairing the damaged wiring inside the RV’s roof. All is well and we know our RV’s 12vdc wiring better for the trouble. But we recommend following an easier path for self-installing your panels. The large hole wouldn’t have been the problem had Jim used a stop-collar on the drill bit and therefore avoided drilling over an inch below the outer skin and into a wiring bundle. The real trick though, is to dimple the roof with a sharp 8d common nail or an awl. Then use a #12 or #14 x 3/4″ sheet metal screw to fasten the panel attachments. 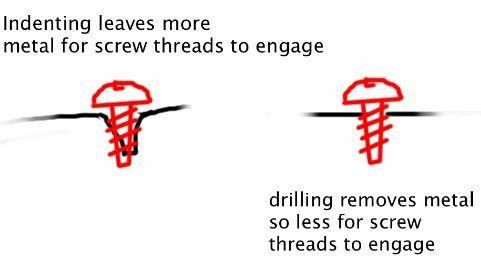 A drill bit removes material from about the hole whereas the awl or nail point pushes down and indents the material. Indenting the roof surface allows the screw’s threads to engage more material than if drilled away. This can provide a very strong and minimal hole without drilling. 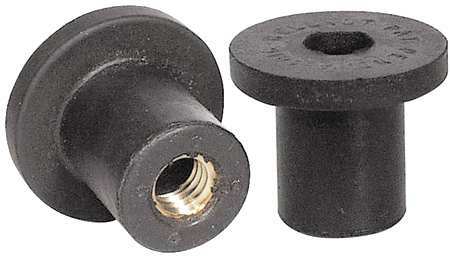 These tilt mount kits are expensive and we could have saved a bunch by fabricating them ourselves. However, the included hardware is first-rate and Carmanah Go Power did the engineering and assembling of the kit so we didn’t have to mess with it. Sometimes it’s nice to take the easy, if a little expensive, way to get a project done right the first time. The result is we now have both our panels tiltable with nicely made aluminum arms and brackets and securely mounted with all stainless hardware. Looks good, works fine. And we’ve greatly increased our solar panels morning and evening gain by tilting the panels to 38 degrees. Big difference. February 5th – Set to same angle as your latitude. May 5th – Set at the same angle as your latitude minus 15 degrees. August 5th – Set at the same angle as your latitude. November 5th – Set at the angle of latitude plus 15 degrees. With one panel tilted at 38 degrees toward the south we have immediately noticed a couple of benefits. We are, by 07:30 a.m. gaining battery charging through our panels to the battery charge controller. We are getting higher amps charging throughout the day resulting in topping off the batteries charging for more than four hours. And we are gaining battery charging later each day due to the panel tilted toward the southern sky. We can only tilt one panel at a time because they are mounted so close to each other. If we tilt them both then one shades the other, reducing the shaded panel’s output by more than it gained by tilting. With one tilted and the other flat, the flat panel is doing as well as we ever had it and the tilted one is greatly improving its output. Flat panels were okay when the sun was at its zenith, but the tilted panel arrangement is much more effective. One of our solar panels is aimed nearly squarely at the sun and the other is helping as best it can. As long as we park approximately east-west (or west-east) we can easily tilt one panel or the other from the trailer’s roof edge and boost our solar charging output noticeably. This has worked out very well. Panel tilting is a cool improvement, and so easy to do.